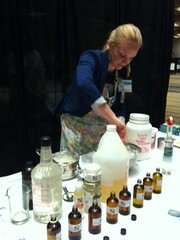 Make your own toxic-free cleaning products! Making your own non-toxic cleaning products is easy, dirt cheap, and effective. 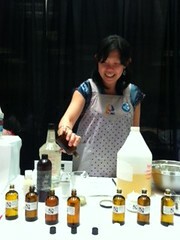 Anarres Natural Health taught us how at the Sage Fair. Recipes from Women's Voices for the Earth can be found here. Contact Anarres to attend your own DIY event! This weekend is Toronto's Sage Fair! The Sage Fair is truly unique – an opportunity to indulge your mind, body and spirit with inspiring workshops on a variety of topics and a fantastic group of exhibitors offering a range of products and services to enhance your lifestyle. 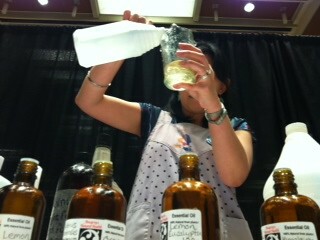 WHEN is proud to be giving toxic-free cleaning product Do-It-Yourself demos with Anarras Natural Health all weekend long! Ever thought making your own products would be too messy or inconvenient? Ever worried that the products wouldn't clean as well? Well, then drop by our booth to learn how easy, cheap, and effective (and even, I dare say fun) making your own toxic-free cleaning products can be. These products are better for you, better for the water, produce less waste, cost much less, and give you that rosey DIY glow. Bring an empty container or two, come by to learn how to do it yourself, and take some home - all Free! For the Sage Fair times and location, see our events page. Welcome to the new WHEN website. Same location but a whole new look and feel. Explore and enjoy!Like it? Show some love! Almost everything we do is based on volunteer labour, and donations from people like you. Make a donation today! Wondering what you can do that will make a difference in your life and the life of the planet? Start small and you are bound to succeed. Here are a few ideas for you to think about to help live healthier and happier in 2012. Choose pesticide free fruits and vegetables, switch your shampoo, have a clothing swap, cut out plastic and educate yourself! Replace 2 of the "dirty dozen" you use the most with organic options. The "dirty dozen" are fruits and vegetables with the most pesticide residues and are the most important to buy organic. Organic are more expensive, but they are more nutritious, less toxic, better for ground water and ecosystem health, and often taste better! Plus, because they are more expensive, you are less likely to let them rot in your produce drawer, reducing your waste and carbon footprint, and increasing your intake of fruits and veggies. Switch your shampoo. When you think about what personal care products you use the most in terms of frequency and amount shampoo probably tops the list. Many shampoos contain sodium laureth sulfate and related chemicals (which can be contaminated with known carcinogens), parabens (possible endocrine disrupters) and fragrances (which may contain allergens and carcinogens). When looking for a more environmentally friendly shampoo, check to make sure your "natural" shampoo does not contain any of these products, because greenwashing is common. If you have dry hair, look for shampoos with natural oils such as coconut and olive oil. If you have thicker hair, try shampoos with apple cider vinegar (or put in your own) to remove residue. Once you've conquerred your shampoo, find other ways to be toxic free by replacing personal care products with safer versions. Wannabe Toxic Free! Have a swap. Swapping clothing, accessories or home items is a form of waste reduction, conserves resources and is better for your health. Many new clothes and furnishings contain chemicals that enter your body through your skin or lungs. Reducing the number of new items you purchase and bring into your closet and home reduces your toxic load. Moreover, swap parties are great ways to get to know your neighbours and make new friends! Cut out plastic. Ontario has excellent recycling, composting, and reuse programs, but for most of us, the majority of our weekly garbage is made up of plastic - plastic wrap, plastic food containers, and other non-recyclable plastic items. These things do not easily degrade in a landfill. Avoid items that are packaged in plastic wrap and plastic containers. Use reusable produce bags. This will reduce waste, reduce air emissions from plastic manufacturing, and reduce your own contact with plastic, which when it comes in contact with oily or warm food, can leach harmful chemicals. Consider reducing the number of plastic containers you use, by making your own dips or salad dressings. They are much more delicious, healthier, and when you get the hang of it, easy to make. Educate yourself. There are a number of informative and inspiring books and films about environmental stewardship and environmental health. Make a pledge to read a book or watch a movie a few times this year to help you learn about the issues and where you can make a difference. Join us! WHEN regularly screens films and reviews books which can be great sources of information. Or if you have recently seen an inspiring film or read a fantastic book and want to share it with others, tell us! Contact our office with a review, or join the conversation on Facebook! WHEN is a non-profit, charitable organization that works with communities on prevention initiatives addressing environmental links to health. To learn more about WHEN, click here. Are you concerned about the cuts to environmental programming the City of Toronto is considering? WE ARE! The Toronto Environment office is at risk - programs such as Community Environment Days, waste diversion programs, urban agriculture programs, tree planting and the Live Green program. READ the consultant's report that recommends the cuts (summarized as opportunities on page 5 and 6). FIND your local councillor and contact them today. Leave a voice message or send a quick email to let them know you think this programming is important. Tell 5 friends to do the same! Women's Healthy Environments Network (WHEN) would like you to add your voice to the City of Toronto's debate about the future of environmental programming and whether it should be sacraficed to reduce the city budget.